This is the recording of my show “Success With Srini” aired Live on Bolly 92.3FM on Saturday Feb 02, 2019. Our purpose is to become effective, to produce, to improve that which we already have. Idea is to set goals, have aspirations, align passions to purpose, and leave the place better than we found in the first place. Oliver Wendell Homes Jr’s response to a young ticket collector during a train ride will get you pondering. Listen to the complete show for all the 5 questions. But the most important question of all: What do I need to do to stand in the little corner of the universe that I’ve given to? Srini Saripalli: Good morning friends and listeners. Thank you for tuning in to Bolly 92.3 FM. My name is Srini Saripalli and I’m here live at the Bolly 92.3 FM Studios on Success with Srini. So we’re going to have an incredible conversation today. I’m here every Saturday between 9:00 and 9:30AM, having a heart-to-heart, soul-to-soul conversation with you, about you. My idea is that at the end of this conversation you will have a conversation going on within your mind about your life; about your relationships, about your finances, about your career, about your business, about your relationships, you know, all of that. Srini Saripalli: Idea is to become effective. Idea is to produce. Idea is to improve that which you already have. Idea is to set goals, have aspirations, big passions lined up with a purpose, and leave the place better than we found in the first place. That’s my goal. That’s the intent with which I come in. Srini Saripalli: It’s raining there, and I want you to be safe as you are listening in to this show, to this conversation. If you can, you are welcome to call in, into the studio. If you have a question right now going on, you have a situation going on, something is bothering you, something is challenging you at a different level all together and you want an idea, you want an inside, you want a segue, you want to share, by all means you are welcome. Srini Saripalli: I have been getting a lot of questions from people saying, “Srini, are you open for consultations?” And my answer is, here’s the deal. If you can, just listen to this conversation. If you stay focused and you participate in this conversation. You don’t need to call in to participate, by the way. You can participate with yourself. Maybe you’re deliberately tuning in right now. Or maybe you were just flipping the channels and you landed here. Either way, if you stay intentional and you participate in this conversation by just listening, and just framing and reframing the parts that you get as a result of this conversation, I think you just don’t need anything beyond that. That’s my data. That’s how I believe. Srini Saripalli: In the past when I was doing some serious consultations, about three to four times in the conversation they would say, “You said that on the radio before. You said that on the radio before.” That’s exactly what this is. I said that on the radio, I’m saying that on the radio right now and I’ll say that to you when I see you in person. I’m going to say that to you through an email. I’m going to say that to you through a phone call, if there is one. It’s consistent. So whatever you get here is exactly what you’re getting there, there’s no difference. There’s no difference. Okay. Srini Saripalli: There’s one quick announcement I want to make before we jump in and get going with this, and that is, the Success 2019 is now happening on March 23rd. I needed some more time to prepare, honestly. So we were supposed to happen on March 9th, we moved it to March 23rd, I’m sorry, March 23rd. That’s a Saturday, okay? 23rd of March, Saturday, that’s when Success 2019 is happening. I get two more weeks to prepare. There were some conflicts around scheduling the speakers, location. In fact, I got a better place now to do it. So it’s for sure happening on March 23rd. Srini Saripalli: So if you were a winner to the previous contest we did on the radio, on the show here, then you will get the new information. So if you haven’t heard back from me, there is the only reason why you did not hear from me is because this was going on. The changes happened and that is now, the Success 2019 is happening on March 23rd. Okay. So all you have to do is go to positivepositioning.com, that’s the website where you can find all the details. You can see the videos, you can see the testimonials from the previous events, previous Success events. Srini Saripalli: And in fact, Success 2019 I believe is happening for the seventh time. And there was one year we couldn’t do it because of a personal challenge, but then that, for seven years, seven times in the last eight years I believe. Continuously every year. Numerous, numerous participants in this event. Numerous case studies, numerous success stories that I have personally received. So I feel absolutely empowered, absolutely, and thrilled to just bring this event to you. In fact I’m not, I’m just the, I’m just the front end guy speaking with you about this event. But then the people who are coming and training and teaching and mentoring you in the room are the best in the world. So they are coming in under one roof for one day. Srini Saripalli: If you have the commitment, if you want to raise your game, if you want to be the best in whatever you do, regardless of whomever you are, no matter what you do. If you have the desire to excel and go to the next level, this is the place for where you have to be. So, go to positivepositioning.com, sign up. The cost is nothing, not a lot, insignificant. I think the best information in the world is free. Okay? The best information in the world is free. For everything else you have to pay. That’s what I want. In fact, if you want the best information, this is it. This is it. If you want anything beyond that, you have to pay. This is the truth. Srini Saripalli: So, get the best information. If you are one of those individuals who want the best information, then you have to go there and try that out. Just mark … our idea is very simple. My idea is to just to cover enough cost for the location and the logistics. That’s all. The promoting on the radio cost money, location cost money, everything has money to it. We’re just covering the costs and that is why the sign-up cost is very minimal. Just basic. I could probably ask for a donation, get away with it. But then when you pay, like even a dollar to show up, there’s a commitment there. There’s a commitment there. So it’s amazing how people process when they invest verus people who … and investment here in terms of not a significant investment, just a little bit to cover the cost. So, positivepositioning.com is the website where you can get all the details. Srini Saripalli: Now if you want to win two tickets to the event, we will do a draw today. And I’ll try to efficiently run the draw as much as possible. Last time we ran out of time, but then I will, I will make it very seamless for you, hopefully. If there are enough number of calls. If you want to … and again, I know when you call in to participate in the draw, you are calling in with the spirit. I understand that. It’s not that you will not sign up and you will not go. That’s not the point. I understand that you’re calling with the spirit. So I want you to be, you know here’s the deal. If you want to register and come to the event, it’s insignificant. Last time I said you can stack up four lattes. That’s the cost, pretty. But then if you win the ticket, and you still want to pay, just buy a ticket for somebody else. You listen, you know that the show … whatever you’re hearing here, this conversation is helping you, motivating you, inspiring you. It’s going to be a hundred times in the room. Srini Saripalli: So, and if you think that somebody’s going to be benefited from … if you are benefiting from this conversation, you will get benefit a hundred times in the room. So you better buy the ticket and give to somebody else. Maybe you’re helping them. Maybe they need that change or they need that push or they need that conversation that will change their life. They need it, you know. Just gift a ticket to them. It’s not stopping you from, just because you’re participating, you’re winning. There no loser on this draw anyway, right? Because everybody’s a winner. Srini Saripalli: And I have this mentality as I come in, I come in to do the show here. I think that every listener, listening for the first time or listening continuously to this show, and I believe they’re winners. I think they have a heart for success. I think they have a soul and a mind for doing something better. And you’re tuning in at nine o’clock in the morning, it’s a rainy day, that tells me that there is some certain level of commitment. And when you know when you are predisposed, when you know the audience is that level, the life of a coach, the life of a trainer or a mentor or whatever it is becomes easier. Much easier. And that’s the beauty of this. 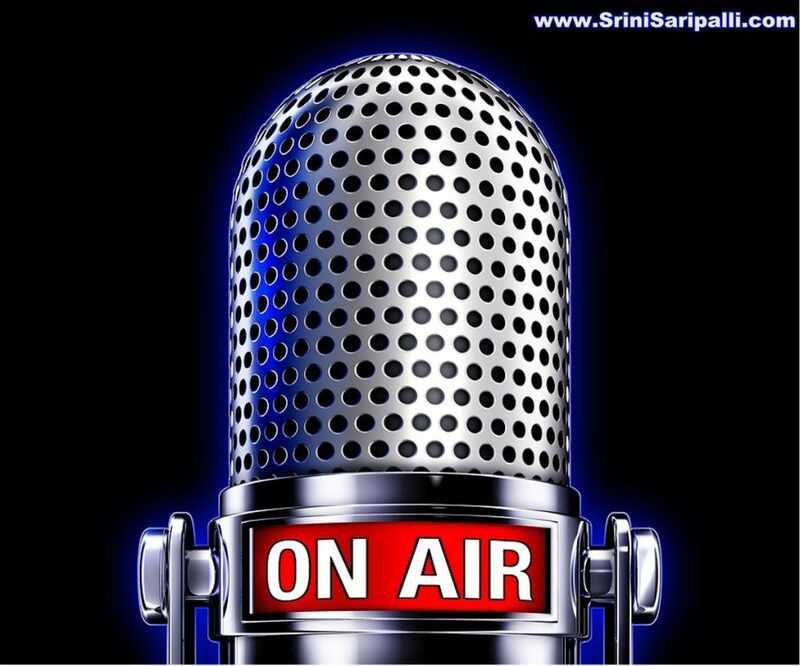 Srini Saripalli: If you’re just tuning in, my name is Srini Saripalli, thank you for listening in. This is Success with Srini, a show on human design, human engineering, human excellence. I am here today to share with you five, in fact to ask you five questions. These are the questions you have to ask yourself. Now we are transitioning into the content part of the show. Okay? Listen up. Listen to this. This is the content part of the show. I want you to stay focused. We’re done with the Success 2019, we’ll come back and do that draw in a second. I’m just transitioning myself in into the content part of the show. Srini Saripalli: So I want to share with you five questions that you have to ask today, if you’re listening. Five questions, okay? Srini Saripalli: The first and the foremost question you have to ask, and I ask myself, by the way. When I say you, I mean myself. What do I want to do? You have a career, you have a job, you have income coming in, you have a house, you have kids. You have family, you have relationships, you have the finances, the taxes, the government. You have everything going on. Is that exactly what you wanted? Question to you. What do I want to do? It’s a basic, fundamental question. When you ask that question, here’s what happens. I’m consciously in the mind. Here’s what happens. Srini Saripalli: The why is, in a good way, if you use it in the right context it’s good. But then usually that is the frame through which people start. But the you start with “What do I want to do?” I’m given this day, I’m given this show, I’m given this time. What do I want to do with my life? What do I want to do? Where am I heading with all this? That’s the question that you need to ask. Srini Saripalli: The next question in the sequence is, what do I want to be, to become in the process. If you want to do the job five years from now, I ask this question all the time in consultation. Hey, where do you see yourself five years, ten years from now? And the reasoning behind that is, it’s not a vague question. The question is because if you don’t see yourself ten years from now doing what you’re doing, then you are better off quitting today. Right? Why even do that which you don’t want to be doing ten years from now? Ten years from now if what you do today is not taking you where you want to go five or ten years from now, what’s the point of doing that today? You’re going to become smart about this, right? Think about it for a second. Srini Saripalli: Where do I want to go? What are the places I have to go to make this happen? Going means not physically going. Like emotionally, mentally. If I go a seminar, if I go to Success 2019, if I go to the Everest base camp, will it take me to where I will go, where eventually I want to go. Going to the mountain, in the [inaudible 00:11:41] expedition or the Success 2019, or any events or anything for that matters. Anything that comes your way, going there. Maybe you’re going home right now, driving home right now. You want to take an exit and do something and just take care of something and then you go home, right? So just taking the exit and doing that small little thing before you reach your destination. Is that valuable? Is that something that has to happen? Or will that add up to that which you want to be or where you want to be or where you want to go to. In some way, does it add up? Or is it a hindrance? Is it stopping you from going where you’re going. Srini Saripalli: I tell you the most difficult part. When I come and do a show like this, the most difficult part is, where do I take the listener? Where do I take the listener? You are investing your time right now listening to this. Where should I take you? Will I leave you at a place that is much more empowering, much more rewarding, much more meaningful than where I found you? Nine o’clock I found you, nine thirty I want to leave you. Or maybe in just about eight minutes, I’m going to leave you. Eight minutes, okay, okay. Srini Saripalli: Okay. I’m going to come back and give you the next two questions, but here’s the deal. The number in the studio is 408-912-5038. Okay? 408-912-5038 is the number in the studio. You have a question. Okay, so here is why you should dial in. I want you to, if you’re listening, and if you can call in. It’s raining, and the road conditions are not good, but if you can call in, just give me your name and where you’re calling from, and you are the only caller, you will win two tickets to Success 2019. It’s now happening on March 23rd. We have a new date, we have a new location, a bigger place, and we have better speakers because of the schedule change. It makes sense. That’s why I made the change. So March 23rd. Srini Saripalli: So call in into the studio. 408-912-5038 if you want to participate in the draw. Now, everybody’s going to win, one way or the other. But just for the spirit of participation, do it if you can. And please make and keep yourself safe as you make the phone call. Okay? 408-912-5038 is the number. The first caller implicitly wins. If there are more calls, we will do a draw and the chances are … Aaron what do you think? We have listeners today? Srini Saripalli: They may not be driving. So we won’t have listeners. The first caller obviously wins, right? Aaron: They might be on the app. Srini Saripalli: They may be on the app. There is an app. If you have not downloaded the Bolly 92.3 FM app from App Store, please do it. Okay? Please do it. Get the app. It’s an awesome app. Srini Saripalli: Okay. Hi Srini thanks for calling in. Your name please? Srini Saripalli: Monica, thank you for calling and where are you calling from Monica? Nonek: Nonek, Nonek, and it’s from Pleasanton. Srini Saripalli: So you said Nonek? Nonek: Yeah, Nonek, yeah. That’s right. Srini Saripalli: Okay. Hold on. I have a difficult in hearing. Excuse, because there is a lot of things happening in the studio as we are speaking. Okay. Pleasanton. Thank you. How is the signal in Pleasanton? How is … the rain and everything, is good? You’re hearing it clearly? Nonek: It’s good, it’s good. Srini Saripalli: Excellent. Thank you. Your name is in, my friend. All good. All good. Nonek: All right, thank you. Srini Saripalli: Thank you, thank you. Srini Saripalli: Hi, it’s Srini. Thanks for calling. Your name and where you’re calling from? Vishal: Hi my name is Vishal. I’m from Hayward. How you doing Srini? Srini Saripalli: Vishal, excellent. Thank you for listening in. Thank you. I got your name in Vishal. Excellent. Vishal: Thank you. Hey, I really appreciate the way you start the tone today about the goal. I know sometimes we divert. I like the goals and the way, where we are going? What is our mission? What is our accomplishment? So I’m glad you started the topic the right time and the right place and the right month. Vishal: We have been having a problem with our government, so I really looking into. Srini Saripalli: Thank you, thank you. I have, Vishal I have one more question I’ll leave you with, which I think will inspire you even more. So let’s go on, I have more than a few callers. Thank you. Srini Saripalli: Hi, it’s Srini. Thanks for calling. And your name and where you’re calling from? Mark: My name is Mark and I’m calling from Hayward today? Srini Saripalli: Mark, right, you said? Srini Saripalli: Mark, excellent. Hayward, thank you Mark. I appreciate you tuning in. Thank you for listening in. Any specific thing that you’re looking at Success 2019 that you think that I can help? Mark: If you have, you believe in the things that you were taught and they’re likely going to work out to a plan for you. Mark: You know what I mean? Srini Saripalli: I just need, excuse me for … they’re telling me that my time is up in the two minutes. I want to wrap this up. But if you hold the line, Aaron is going to take you off air and going to take your phone number, I think you have incredible stuff to share. I love your philosophy, the way you’re approaching this. He’ll take your phone number and I’ll call you back. Would that be okay with you? Srini Saripalli: Excellent. So Aaron will take your number. He’s taking you offline right now. Srini Saripalli: Okay. 408-912-5038. I have less than two minutes remaining. If you want to participate in the draw for Success 2019, here’s what you have to do. You have to call in and just give me your name and just give me place where you’re calling from. I’ll get your name into the draw. And it’s right before we close the show we going to draw your name. And by the way, if you want to listen to this show, the recording of this show, you can go to my website srinisaripalli.com, and you can get the recording within 24 hours, it will be up and running on the website. You can also listen to this, if you have an iPhone and iTunes access, you can get this as a podcast. The podcast usually is up within 48 hours from the show. In fact, less than 48 hours. So that’s where you can get the show, the show recording if you want to listen to the show. It’s on iTunes, it’s on my website. Srini Saripalli: And again if you want to call in to the studio, 408-912-5038 is the number in the studio. You’re welcome to call in. My name is Srini Saripalli. I’m here every Saturday between nine and nine thirty. The idea is to empower you, the idea is to have a conversation with you, the idea is to stimulate a kind of thinking that creates a, predisposes you towards the success that you are seeking in your life. That’s my idea. That’s my goal. Srini Saripalli: Hi this is Srini. Thanks for calling in. Your name please? Bayal: I’m Bayal from San Jose. Srini Saripalli: Bayal from San Jose. Bayal I got your name, thank you. I have a few callers, let me take those. Otherwise I would spend a little time with you longer. Thank you, I appreciate it. Srini Saripalli: Hi this is Srini. Thanks for calling in. Where you calling from? Your name please. Srini Saripalli: Rina. Thank you. Rina Shah: Calling from Fremont. Srini Saripalli: Fremont, thank you. If there is one thing that you would tell me quickly that you are seeking if you’re coming to Success 2019? Rina Shah: How to motivate myself every day. Srini Saripalli: Every day, right? Okay, awesome. That’s, this whole thing is about motivation. This event is all about motivation, thank you. I got you covered. Srini Saripalli: Okay, I got you covered. Okay. 408-912-5038. 35 seconds. Oh, okay, one minute remaining. Aaron is telling me. If you want to participate in the draw, I’ll take your name quickly and I’m going to, we going to announce that. We have Nonek, Vishal, Mark, Pera, Rina who called in. Their names are in the draw, going to do the draw in just a few seconds. Srini Saripalli: Hi this is Srini thanks for calling in. Your name please? Doulga: This is [Doulga 00:21:04] from Cupertino. Srini Saripalli: Durga from Cupertino. From my town. Excellent. I make preferences so that you can win. Okay Doulga, I got it in. Srini Saripalli: 408-912-5038. You want to listen to this recording then go to srinisaripalli.com. You can, if you have iTunes, the podcast will be up there. I think you can listen to the podcast from anywhere. So you can get the link from the website also. Srini Saripalli: Okay, quickly wrapping this up, and Aaron is now going to do the draw. We have … Aaron just run those numbers. I tagged all the numbers. Just you have to roll the dice, pretty much. Okay. Okay. Okay. Excellent. Srini Saripalli: Here’s what happened. Okay. So you tell me towards the end? Okay, I still have few seconds, okay? Aaron is telling me I have few seconds. We’ll announce the name in a second here. Srini Saripalli: So here is the last question. And I believe that was Vishal who said, Vishal I told you to hang on for a few seconds before I give you a couple of more questions. Here’s the bigger question you have to ask yourself. What do I need to do to stand in the little space, the little corner of the universe that I’ve given to? We have a little corner of the universe, okay? A small little space has been given to us. What do I have to do, or what do I need to do, to stand on the little corner of the universe that I’m given to? That’s the question, the profound question. I’m going to go through this question later on when I see you live in the event. I want to talk about this later on, on the show, on the upcoming shows. Srini Saripalli: We just did a draw. Aaron has the number. Aaron says the number one is the winner. Which is Nonek. You are the winner. And you were the first caller. It so happens. We did the dice. Your name is in. You are the winner. All you have to do is send me an email, info at positivepositioning.com. That’s the email. Info at positivepositioning.com. Send me an email. I’ll get you all the details. Srini Saripalli: Srini Saripalli wishing you a wonderful day, a wonderful weekend, and a wonderful life ahead. Thank you all. Have a good one. Bye now.